You've probably heard of necrotizing fasciitis, also known as flesh-eating bacteria. But bacteria do not actually eat human flesh. They're actually trying to gobble up something a lot weirder. Here are ten of the stranger things bacteria naturally (and unnaturally) eat. You'll never look at dirty underwear the same way again. Does flesh-eating bacteria really make a meal out of you? The bacteria Geobacter sulfurreducens changes the isotopic form of uranium through the transport of electrons, sucking up energy from the electron gradient and creating a stable, solid form of uranium in the process. This solid form of uranium is easier to recover in clean up efforts. These bacteria are currently being studied at uranium-contaminated sites in Washington and Tennessee. Arsenic is poisonous to humans, killing by quickly disrupting the production of ATP in cells. The GFAJ-1 strain of Halomonadaceae, a bacteria found in some California lakes, thrives in the presence of arsenic. When scientists substituted arsenic for phosphorous in nutrient sources, GFAJ-1 easily substituted arsenic for phosphorous in the creation of proteins. The researchers controversially suggested this quality could increase the probability of finding extraterrestrial life, as phosphorous may not be essential to all life forms. Several types of bacteria naturally consume oil, but in the early 1970s General Electric scientist Ananda Chakrabarty engineered a form of Pseudomonas putida capable of consuming oil in a much more efficient manner. A strain of Alcanivorax naturally appeared and consumed oil plumes generated from the Deepwater Horizon spill as well. Researchers at the University of Iowa found an unusual food source for Pseudomonas putida CBB5 - caffeine. The group fed CBB5 caffeine as it's only source of nutrition, with Pseudomonas putida CBB5 eventually metabolizing caffeine into carbon dioxide and ammonia. Bacteria are commonly used to break down waste at sewage treatment plants, but supplying oxygen for the bacteria becomes a problem. The bacteria Brocadia anammoxidans is able to survive in the absence of oxygen by living off of ammonia and nitrite, two molecules prevalent in human waste. In the process of consuming human waste, the bacteria excrete hydrazine, a molecule used as a thruster fuel for space probes and as a propellant for military artillery. Bacteria don't necessarily eat large rocks, but their acidic secretions dissolve them. This is becoming a problem in many abandoned mines within Colorado where antiquated blasting techniques left massive cracks in mine walls. These cracks expose the remaining minerals inside to unwelcome water and bacteria. When the bacteria consume ore containing sulfur, they can excrete sulfuric acid, allowing for the oxidation of iron and causing damage to other rocks if enough acid enters the surrounding water. A 2009 expedition grazed the bottom of the Pacific Gyre, so that researchers from Denmark's Aarhus University extracting 90 foot cores of sediment. Within the sediment they found an unnamed form of bacteria that went quite along time without substantial food due to a scarcity of nutrients in the sediment. The sediment surrounding the bacteria could be up to eighty-six million years old, so these microbes went quite a while without a nice meal, slowly metabolizing the nutrients they could find. A strain of the bacteria Wolbachia targets an interesting part of the Aedes aegypti mosquito - the gonads. The bacteria doesn't destroy the entire reproductive organ, but they make a home there and alter the course of reproduction. While this is a cruel move on the part of Wolbachia, it does prevent the mosquitos from carrying the Dengue virus, a virus that infects 50 million people in third world countries each year. The remains of the RMS Titanic sit a few hundred miles off the coast of Newfoundland and two miles below the ocean surface. 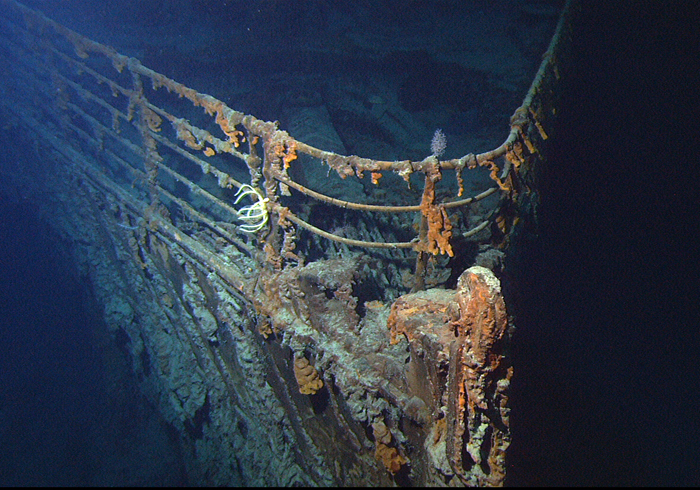 At this depth, bacteria deemed Halomonas Titanicae are consuming the steel of the Titanic as a fuel source. The only material the bacteria stay away from on the ship are brass items. Brass contains copper, which quickly kills most bacteria. Living on the International Space Station creates a number of problems. In the late 1990s, Russian scientists created a cocktail of bacteria to degrade the underwear of astronauts to cut down on waste, with the hopes of harnessing the resulting methane gas to use as fuel. Astronauts aboard the International Space Station are only allowed to change their underwear every three days due to waste disposal issues, so they might be looking forward to the implementation of this system. 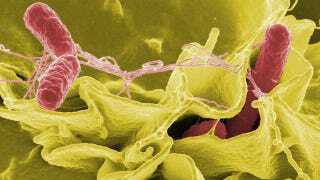 Top image shows the bacteria Salmonella typhimurium at work NIH. Additional images courtesy of NOAA, the International Atomic Energy Agency, ninasaurusrex/Flickr, the International Bird Rescue Research Center, jasmined/Flickr, and Christian Rößler/CC. Sources linked within the article.